Hemmingway could not have painted a more perfect setting with his words. Is this a scene from the keys or off the cape? The yacht is most impressive with two sails. 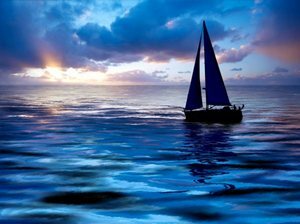 The calm sea provides the ideal waterway. The sky could not be more beautiful in hues of blue, pink and yellow. The perfect sunset for a perfect day.